Hi Hi, my name is Kirsi and I am from Finland. I came to live in Gran Canaria in May 2013. Admittedly, I had my prejudices about Gran Canaria, fearing the island would be loaded with tourists all year round and a cheap tourist trap. I worried, that there would not be much to see or do, especially when living here and not just visiting for a week or two. Well, I was proven dead wrong and I am glad. Besides loving the sun and warmth, I love speaking different languages. Since my arrival I have made many new friends from different nationalities. And that is so easy, since the south of Gran Canaria attracts a multicultural society. People from all over Europe and other parts of the world are living here either for the winter or all year round. Before Gran Canaria I lived in Italy for about 18 months. Things did not work out as planned and I did not want to stay there. A friend was moving to Gran Canaria with her boyfriend and they asked me to join them. I decided to take a chance and come and see how I like living here. Another thing close to my heart is dancing. 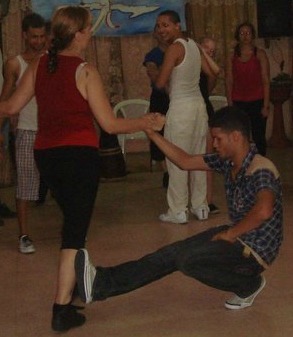 I have made several dance trips to Havana in Cuba. 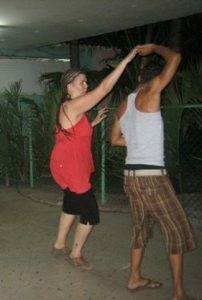 Cuban Salsa, Son and Reggae-ton are the ones I love to dance. Before coming here I had just lost my dear dog Jeppe, a 7 and a half year old German shepherd to a tumour in his stomach and I was totally heartbroken about that. I had decided I would not take another dog for a long long time, but then I found a Facebook page of a local animal association, TARA Animal Respect Association, and I fell in love with one the dogs that was looking for a home. So within a week from the day I came here I adopted Sioux, a mini German shepherd who was then about one year old, and she has been with me ever since. You can see us together on the picture at the top of the page. Animals are also close to my heart and I have had several dogs and cats over the years and I think I will always have a pet as part of my family. And the last but not least is my passion for writing. Sharing my own experiences is really something I like to do and I am glad to have found this opportunity with the Gran Canaria R Guide. When you get paid to do something you like it becomes a dream job! I write about my discoveries of the island, the cooking, share recipes and give you tips on how to do things on the island. I have not regretted my decision to come and live here once since arriving on this sunny island. Being a summer person, I love the sun and the sea. So, Gran Canaria is my dream place to live and I am really glad I decided to come. If you would like to contact me simply leave a comment below in the text box. I will get back to you as soon as I can.